For a book that’s chock-full of insight into playing successful soccer, "Masters of Modern Soccer: How the World's Best Play the Twenty-First-Century Game" stands out because it comes mainly from the players’ perspective. Author Grant Wahl succeeds in turning technique, tactics and strategy into enjoyable reading by approaching the topics through the eyes of exceptionally talented and intriguing players, beginning with midfielders Christian Pulisic and Xabi Alonso, followed by forward Javier “Chicharito” Hernandez, defender Vincent Kompany and goalkeeper Manuel Neuer. Wahl’s visits with the stars reveal how intensely they study the game, how they stay on top of their game, and how they reached the top level. Especially in the case of Pulisic, we get more insight into the childhood of this exciting young American star -- and not just the soccer part. When Mark coached the Detroit Ignition of the Major Indoor Soccer League, when Christian was 8, “the Brazilian players would challenge the youngster to learn ball tricks (which he would perform the following week)." Small even among his peers when he joined the U.S. U-17 Residency Program, “I had to use other ways and try to outthink the opponents even more,” Christian says. Unlike Pulisic, Kompany was a big kid. And the Belgium and Manchester City defender reveals that not following a coach’s advice turned out to be vital in his future success. “And that just did it for me. [I wanted] people to be surprised to see my skills, that I could do things that a striker does. I was obsessed by it, and I kept working until they said, ‘Vince is really good when he plays from the back.’ They used the words elegant and flair. Wahl points out that Anderlecht’s approach -- to keep the ball on the ground -- jibes with U.S. Soccer’s ban on heading at ages 10 and younger. And Kompany’s experience should allay the fears of those who believe heading skills need to be learned early on. Wahl does include one coach in his lineup, the Spaniard Roberto Martinez, who guided Wigan to one of the biggest upsets in the last decade -- the 2013 English FA Cup title -- before taking the helm of World Cup-bound Belgium. “I have never believed in managing through punishment, or having the stick, or forcing a player to perform a certain way, because I don’t think you can achieve a dream that way,” says Martinez. With Martinez and all of his subjects, Wahl manages to bring the reader into the room for fascinating visits with engaging soccer personalities, making the book a soccer junkie's delight. For coaches and players aiming to improve their craft, "Masters of Modern Soccer" is a unique and valuable contribution to the abundance of soccer how-to sources -- mostly coaches telling other coaches how to coach -- thanks to Wahl's appreciation of the players' views and his adept delivery of them. 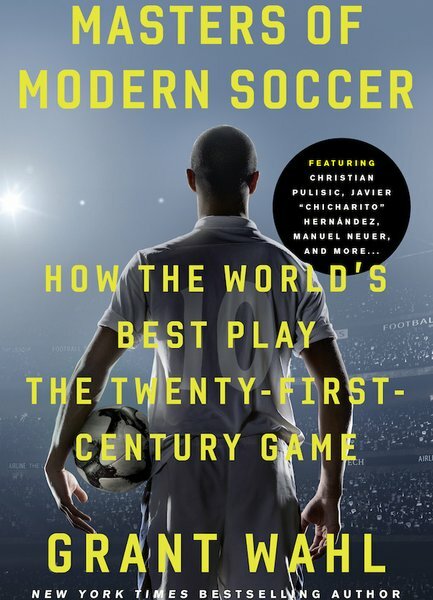 Masters of Modern Soccer: How the World's Best Play the Twenty-First-Century By Grant Wahl 260 pages (Crown Archetype, 2018). Available in hardcover ($19.95) and Kindle ($13.99). 6 comments about "Grant Wahl's 'Masters of Modern Soccer': A unique contribution to coaching and player education". Kevin Sims, May 11, 2018 at 3:35 p.m.
Key threar to Pulisic's development, similar to so many others to become big timers, is his time competing against people of physical superiority. This environment forces the player to succeed via speed of play (speed of thought/decision-making, technical efficiency, deceptive touches, courageous touches, clever moments, surprise moments). Of course, it helps that he now possesses raw speed of foot as well, but the speed of foot without the speed of play finds a low ceiling. I continue to be concerned at the number of "better players" (speed of play) who are cut in favor of "better players " (bigger, stronger, faster). We must be able to identify those with the potential of the former "better player" who may mature into the latter "better player" as well. There is nothing new here, but we must have coaches and scouts who can quite literally see the difference. Wooden Ships replied, May 11, 2018 at 8:47 p.m.
frank schoon replied, May 12, 2018 at 11:06 a.m.
Kevin ,you are so right in how they pick youth as far as physical size and physical speed over technique and brains. Cruyff stated what it comes down to in soccer is ball handling speed and brains, nothing about the physical attributes that is so stressed here. The American socccer scene should have learned this by now in the past 10years for Barcelona, had the most successful midfield with Xavi, Busquets and Iniesta(not too mention munchkin Messi). These were players that had no physical size nor physical attributes but what they had brains and ball handling speed. Yes, the coaches should be capable of seeing the difference, but is the problem. One, In order for us to play with players who rely on technique and quick ballhandling we have to play a STYLE of ball which fits those players. That the coaches have to understand the game using positional play, letting the ball do the running not the player. Two, Using those types of players means we have to play to an attacking style, 3 attackers up front of which 2 are wingers (4-3-3); we play an offensive defense , in other words play in the opponent's half thus cutting down their attacking space. This manner of play will fit our technical players , who are not physical nor speed demons, for us speed is between the ears not with the legs. So our style of ball should not be of a Counter attacking quality which requires too much physical efforts. In sum the coaching philosphy and training has to be more cerebral, a la the Cruyff/ Guardiola type of game. Bob Ashpole, May 11, 2018 at 10:19 p.m. Timely article from my viewpoint. My copy arrived last night. Been looking forward to reading it. Next month Arena's book comes out. Also looking forward to reading it too. frank schoon replied, May 12, 2018 at 11:38 a.m.
Bob , I hope he writes this book with the intention that it will help coaches in their process of developing their players. In other words, I hope he asks like, as a kid, the frequency of play, where he played as kid (pickup),what practiced on his own, who he learned from and what did he to incorporate in his play, what did he learn from his coaches, etc ,etc.. I learned back in the early 80's that it is books like this, biographies, or autobiographies of players, where you learn so much about coaching and teaching skills instead of buying books like, " 10,000 drills in making a soccer player". I know the author is not a soccer player and therefore he can miss some of finer aspects that could help a coach, but we'll see. Bob Ashpole replied, May 13, 2018 at 4:11 p.m. The way Arena's book is marketed, it is a critique of the sport in the US.